Oceanview Cottage in Latimer Point private beach community. Minutes from Mystic and Stonington. View of beach and Long Island Sound. Home is spacious with large great room with views. New Deck Off of Great room with Large glass doors enhance the view from the great room and add the perfect outdoor living area for meals and relaxation. Elevated deck is private and has spectacular views. The entire second story is private Master Bed/Bath with access to Deck. Appliances are new as is flooring/carpet. Community is family friendly and safe. New children's play set is within view of cottage as is the private beach. Community has two private sandy beaches, showers and swim rafts at each. Minutes to casinos, Mystic Seaport and Aquarium. Fishing sailing and boating all nearby. Great place for kayaking with easy launch area. Kayak/boat access to Mystic River is easy. Two Kayaks available for rent. Spent my summers in Latimer Point as a child and teenager. Was able to buy a home in 2007 to fulfill a childhood dream of returning to Latimer point Forever. The Latimer Point Community is quiet, family friendly, safe with great beaches and water access. Two sandy beaches with showers and swim rafts. Docks to crab or fish off. 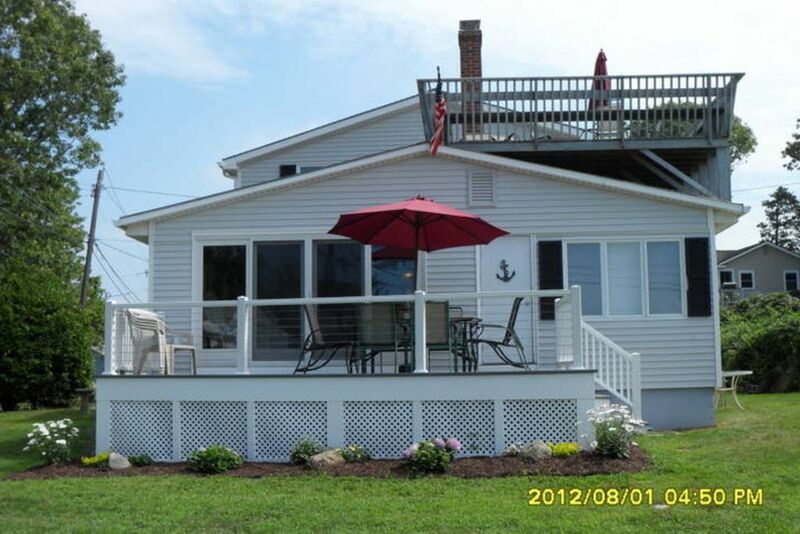 It is a charming, classic New England beach cottage community. Great house friendly beachside neighborhood. The house is spacious and clean. The views of the Long Island sound from the decks are awesome. The private beach is steps away with a roped off swimming area and raft. The neighborhood is quaint, quiet and family friendly. There are many great nearby restaurants. My family stayed here over Columbus Weekend to see our son at the United States Coast Guard Academy. The location was perfect, with a beautiful view and relaxing atmosphere. We enjoyed our family time together in a home environment instead of a hotel setting, everyone in the family liked it better than a hotel stay. The pictures are accurate, the place is very clean. The down stairs bathroom is out dated, so our family only used the one upstairs but that was ok. We enjoyed playing horseshoes event though some of us were not very good. It is great for families. Rick the rental person was very friendly and very accomodating. This was my family's first time to rent a summer house, when traveling but it will not be our last. The house was clean, the bedrooms were a great size, the living room/dining room combo was open with a picture window over looking the Sound. Our kids - 8, 4 and 2 had a tremendous time; played all day on the beach, playset and docks......what was terrific was after they went to bed (exhausted!) we were able to still enjoy the surroundings on the 2nd floor deck over looking everything. The low tide provides you awesome seashell seeking, and high tide provides a good swim to the float! The water is very clean. To eat try the Sea Swirl, great food and Ice cream - Mystic Mkt has some wonderful cold salads...excellent! The cove is nice and Abbot's was wonderful! We hope to stay here next year! What a find! The Mystic and Stonington areas are rich with history and sightseeing opportunities. Mystic Seaport, Mystic Aquarium and Casinos are close. Both Mystic and Stonington have many great restaurants and shops. Mystic Village is Nearby. Watch Hill RI and Newport RI are 25-50 minutes away.